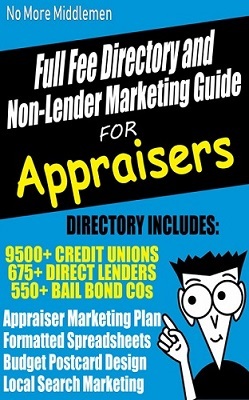 The Appraiser Marketing Guide and Directory has 9,500+ Credit Unions, 675+ Direct Lenders, and 550+ Bail Bond Companies that don’t require the use of an AMC! This guide shows you how to work directly with clients, get paid full-fees, and diversify your business. The Full-Fee Directory gives you greater choice in who you will work with and for how much. Begin converting your practice back to Full Fee Appraising. 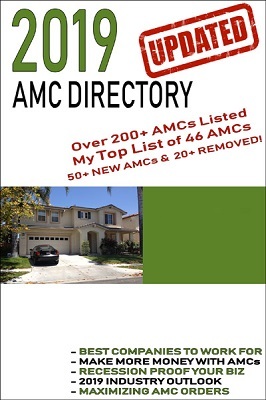 Avoid AMC pressure, endless stipulations and low fees – Find full-fee clients and increase your income!